The British members the Helly Hansen – Prunesco Team conquered Cape Froward after six and a half days race averaging one daily sleeping hour. They transited 590 kilometers through the Chilean Patagonia, enduring an adverse climate with the sole force of mind, obtaining an advantage of almost one day over the French from Easy Implant, who ended in second place. The Cross of the Sea of the End of the World indicates the very last place of the American continent, measures 8 meters in height and is located at the top of Cape Froward, one thousand meters over sea level. The members of the British Team had to arrive to this place in order to win version number 7 of the Wenger Patagonian Expedition Race. Photographers, reporters and members of the organization witnessed the arrival of one of the best teams that has ever participated in this competition according to that stated by Stjepan Pavicic, the event director. Helly Hansen-Prunesco hugged the cross on this February 16th. at 22:36 hours. None of the four sportsmen showed any sign of physical or mental fatigue, but swelling and scratches in their legs evidenced the 590 kilometers of cross country walking through dense forests, rowing in kayaks by the Magellan Strait with a hostile wind or climbing a vertical rock of 130 meters height during the night. Bruce Duncan a member of the team was happy to have finished, assuring that the physical part was only relevant until the third day of the race where the mind is the one starting to pedal, walk or row. Stated as well that climate made sleeping a problem, rather doing it “at intervals” around 15 minutes, supported on foot by its trekking poles while water and wind was blowing sideways. Body, mind, will and understanding by the team are vital elements for success, being shown in this expedition that five of the nine quartets abandoned the road; Tress Pass and Almas Patagonicas from Chile, Quasar Lontra Master from Brazil, Medilast Sport – La Tercera and Buff from Spain. Besides the victorious British, second place was obtained by the French Easy Implant 19 hours after the winners, while in third place the Americans from the Spirit of Canada, arrived today at 7a.m. 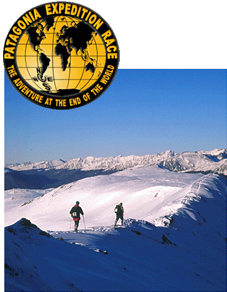 In this manner the world’s most authentic adventure expedition where the competitors have to surpass their limits, comes to an end. This is illustrated in the sentence of a competitor who stated at the end of a past edition: “we have surpassed the limit of our dreams and our own limits”.